A patina on the surface, built up over many years and even with old marks and damage, is part of the character and value of a piece of furniture and should be preserved. If the surface is badly damaged and needs restoration, consult a specialist dealer for advice. Waxing with a good quality polish based on beeswax (not spray polishes), brings out the colour and grain of the wood and provides protection. Put a small amount of polish on a soft cloth and rub the piece until the wax on the cloth shines, This will burnish the surface and evaporate any solvent. Then polish with a clean duster. If possible, apply the wax at night to allow it to nourish the wood and polish the following day. If the wood has become very dry, the wax will soak in rapidly and should be applied regularly until a good patina has been developed. Normally, wax polish need not be used more than once every few months as too much wax will cause dullness and absorb dust. However, request dusting is important using a clean, dry, soft duster. This will encourage a hard skin to form which enhances the patina. Fluctuations in temperature and humidity can damage furniture, especially inlaid or veneered pieces. Central heating dries the air so the moisture needs replacing. Humidifiers can be readily bought, ranging from simple devices that clip on radiators to sophisticated electric models. Even placing a bowl of water near the furniture can be of help. Damp rooms can also cause problems which can be avoided by using a dehumidifier. The ideal humidity level is around 50 to 55 per cent and this can be checked with humidity indicator cards, strips or a garden hygrometer. The room temperature should be kept as constant as possible, with central heading left on low at night. Rooms should be kept well aired. If, in spite of precautions, furniture starts to warp or split, do catch the problem early and contact a professional restorer immediately. Antique furniture should be treated with care and respect. Never tilt back on a chair, open a drawer using only one of two handles or drag furniture rather than lifting it. Do not lift a table from the top surface but from the lowest part of the main frame. Chairs should be picked up from under the seat. Honest and sympathetic restoration is quite acceptable for antique furniture. However, it should only be done by reputable professional restorers who will use the correct traditional materials. Chipped or lifted veneers should be professionally repaired as soon as possible. Only water-soluble wood glue should be used for minor repairs undertaken at home. Small chips of wood, veneer etc. can be held in place with masking tape (not sellotape) while glue is setting or prior to professional restoration. Drawers and doors which stick can eased by rubbing candlewax on the surface. Dry, cracked leather on desk-tops can be revitalised with a lanolin and beeswax preparation after spot-testing a small area to ensure it does not stain. Clear neutral show cream or leather cream can also be used. When evaluating and caring for antiques, an important factor to consider is the type of finish that has been applied to the wood. The finish can be a clue to the age of the piece and will dictate how the piece should be cared for. Wood furniture is finished to protect the wood and/or to decorate it. Wood is a porous material and unfinished wood will absorb dirt and moisture. The finish is intended to create a barrier against dirt and moisture. The finish can also decorate the wood by adding color, if a stain is added, or shine. Furniture finishes fall into two categories: oil and film. Oil finishes penetrate and form a barrier just below the surface. They also leave a very thin film on the wood. Oil finishes include straight oil, such as linseed oil. Oil finishes do not offer much protection for the wood, because the film on the surface is very thin. Linseed oil was used long ago because it was inexpensive and readily available. Oil finishes are still used today on new and antique furniture, because they are very easy to apply and give a very natural look the the finished wood. Film finishes create a film on the surface of the wood that can be built up to the desired thickness by applying successive coats of finish. Film finishes offer better protection because they leave a thicker film on the surface of the wood, which protects against water and scratches. Varnish and water base are common film finishes. Most of the better 18th century furniture and almost all of the 19th century furniture is finished with shellac or varnish. Water base finish is a development of the 20th century and resulted from concerns over pollution, so it would not be used on antique furniture by enthusiasts. Shellac was the favored finish throughout the 19th and early 20th century. Shellac is a natural resin secreted by lac bugs. Shellac is easy to apply. 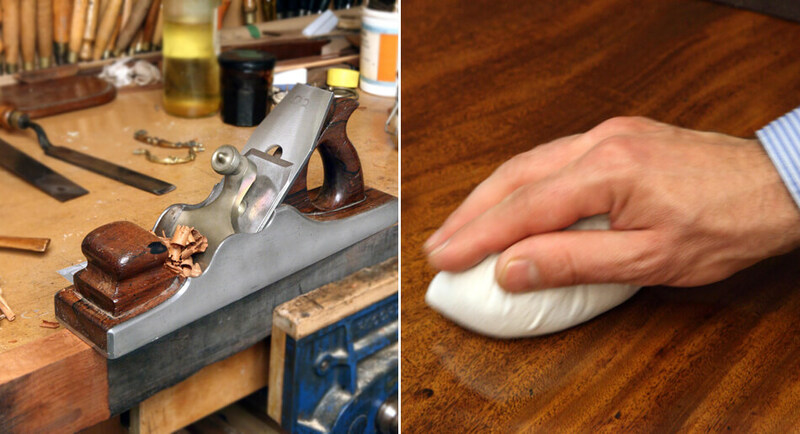 In the early 19th century, a technique was invented for rubbing shellac to a very high shine, called French Polishing. Despite it’s potentially beautiful appearance, shellac is very susceptable to damage by alcohol, water and heat, and is easily scratched. Finally, although wax is usually applied over a finish as a polish, it is sometimes used as a finish, because it has the least affect on the wood’s appearance. It offers virtually no protection to the wood against moisture.